It’s been over two years since Professor Suzie Hanna and I recorded Glenda Jackson reciting ‘The Blue from Heaven’ in a little Woolwich studio. Since then, the track has been waiting patiently in the wings as Suzie experimented with ways to animate Stevie Smith’s extraordinary poem. Suzie tested out filmed footage, symbolic imagery, collage (all juggled with running a busy Masters course at NUA) but nothing seemed quite right for this strange, resistant little text. Describing Arthur riding through a blue world – coloured by mysterious gigantic cornflowers, which tower above his head – the poem challenges us to separate the literal from the symbolic, the metaphorical from the nonsensical. So it was very special to be able to watch a whole rough cut of the film, for the first time, on 10th August 2018, at a session of the ReLit Summer School run by Dr Sally Bayley. We’re lucky, in Oxford, to have the Ashmolean Museum. It’s free, it’s beautiful; it runs amazing events; its collections are stunning. And last Friday, the museum very kindly allowed me to run a peripatetic class on Victorian literature, as we walked around its galleries. I’m involved in a few projects outside my DPhil. One of the most exciting: I’m advising on a short animation of Stevie Smith’s poem ‘The Blue From Heaven‘, by the brilliant animator Professor Suzie Hanna. 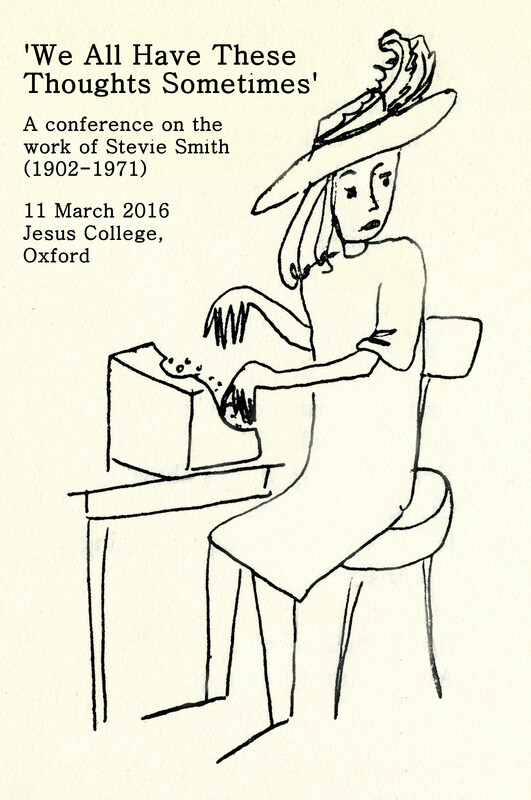 The Stevie Smith conference on 11 March 2016 was slightly unusual for a few reasons. For one, we were lucky enough to work with Denbigh School and The Cooper School as an outreach project. Nearly two months after the first Stevie Smith conference, I’m finally getting round to writing it up! I move down to Oxford in two weeks, to start my English DPhil. I’m excited and invigorated, but also apprehensive. Over the next three years, I’ll be trying to place articles in peer-reviewed journals, give talks, teach, help organise conferences or seminars, disseminate my research in more accessible formats and – of course – actually research and write my thesis! That feels like a lot of pressure. I want to lay as much groundwork as possible, to help these three or four years run smoothly.